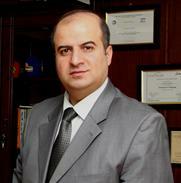 In 2000, he had the vital and active role in cooperation with the Turkish 77 company to establish 77 Group for Contracting and Construction, and after the fall of the X-regime, he had an effective role in the reconstruction of infrastructure in the whole of Iraq generally and in KRG in particular, where he participated in building tunnels and bridges in cooperation with the central government, the government of Kurdistan region and the engineering bodies of the Coalition Forces. Also he was chosen as a member at the General Federation of Iraqi businessmen/ Baghdad, and later on he established the Federation of Iraqi Businessmen / KRG in cooperation with elite and well-known businessmen and was elected as a president of the Federation in 2007. In 2008, he was honored in getting the position of (The Iraqi-Liberians Economic Adviser) and founded the Iraqi-Liberian advisory body; also he was elected as a member at the Council of the Arab- Czech Chambers of Commerce in 2008. Also he founded the Satellite TV-Channel (United Media in 2008), and later on the United establishment for Information and publishing, as well as Hawler Satellite TV-Channel. In 2009 he founded Al Tayyar group, and lately in 2011, he became one of the founders of the Investors’ Federation in Kurdistan.